Recently, a new client from the Philippines bought one set of our mechanical coconut shell and rice husk briquette making machine. View the goods loading photographs of this order below. Don’t hesitate to contact us if you are interested to get more information and factory price. This client owns a factory which includes a large industrial boiler. The boiler used to burn firewood. However, after understanding the benefits of biomass briquetting technology, he decided to buy one briquette making machine to make his own fuel briquettes and use them as an replacement of firewood for his boiler. R ice Husk contains about 30-50% of organic carbon and has a high heat value of 13-16 MJ per kg. 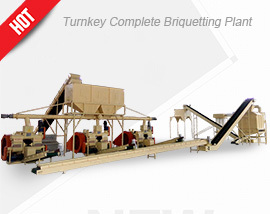 Rice Husk is what is left collected after rice milling and has high moisture content. In order to use it as a fuel-efficient resource, thermal processes like combustion, gasification and pyrolysis are applied for its processing, which in turn can be used for household purposes such as cooking, house heating and for commercial purposes such as industrial boiling and even generating electricity. Coconut is a permanent crop that grows in about 92 countries today. The Coconut shell has a high calorific value which can be used to produce steam, energy-efficient gases and bio-oil. Coconut Shell contains lower ash content than others, high volatile matter content and being a permanent crop, is available in abundant quantity at a cheap cost. The carbon content in Coconut shell leads to the production of a superior quality residue which can be converted to activated carbon in waste water treatment along with the potential of replacing wood and other traditional fuel sources. 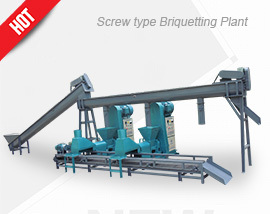 When you require extensive processing of raw materials for fuel production, there are few machines that can replace the Punching Biomass Briquette Press. This rice husk and coconut shell briquette making machine employs a two-pronged compression technology which includes the pre-pressing of the raw materials followed by the compressing, using the application of piston stamping. 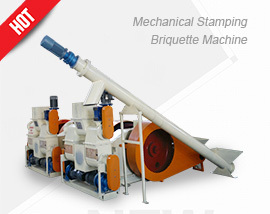 This type of briquette machine is capable of manufacturing fuel briquettes with different size, diameter ranging from 8mm to 70mm. Each material may carry a different composition and in order to accommodate this, the machine comes with a speed regulating motor which is designed to factor in the material feeding speed, which allows for each material to be fed in at a uniform rate. In order to enhance production quality, it contains a separate lubricating system, functioning between each major feed, ensuring optimal performance. When it comes to the durability and strength of the machine, the spindle is made from 45# carbon steel, further protected by CR plating on the surface. One of the major advantages of this machine is its low power consumption, consuming only about 40 kWh per ton of biomass production. This enables a longer life and a superior production capacity.